Our friend Gavin must have been in Yorkshire today as he sent me this shot of the breakaway in the Tour de Yorkshire going through Leyburn for my guest picture. The promised better weather arrived today but it took its time and didn’t really arrive until the afternoon. As a result, I cycled along the road to the producers’ market in just a hint of drizzle. Still, the purchase of fish, cheese and good meat cheered me up. The trouble with buying seasonal local food though is that it is seasonal and local so there was no honey or venison at the moment. It makes the anticipation for their return to the market all the keener. Mrs Tootlepedal wasn’t letting a little dull weather spoil her gardening and spent almost all of the day hard at work. I helped where I could and took time out to mow the front lawn and take a few pictures. Mrs Tootlepedal said today that she sometimes wishes that she could freeze garden time at this time of year because she loves the colourful state of things so much. I took a few pictures to try to capture some of that feeling. Mind you if the colour was like this all the time, maybe we wouldn’t appreciate it as much as we do when it comes after a long, cold, grey six months. The tulips are in full swing. 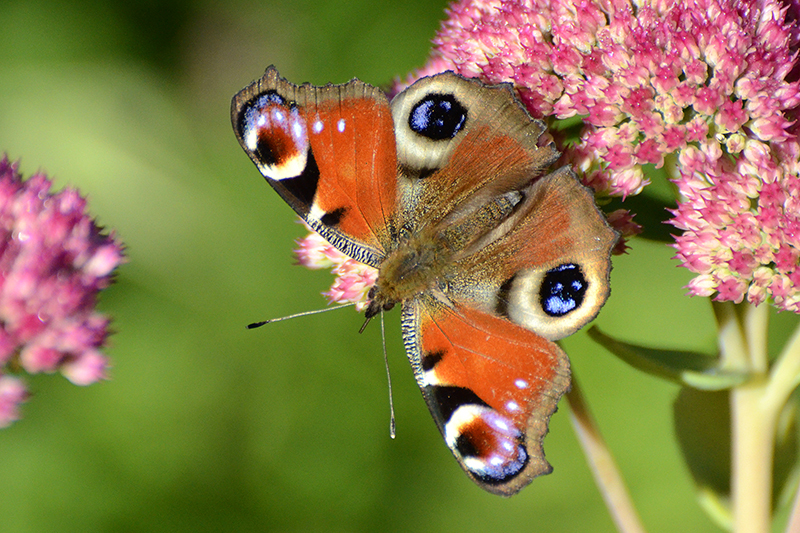 In all shapes and colours…. And some have friends too. …to take their place as daffodil of the day. There are other colours, even though they are not as prominent as the tulips and daffs. And I was pleased to see bees busy all over the garden, although the fruit pollination is what I like to see best. While I was looking at flowers, creatures big and small intruded into the frame. The small were very small. …breaking off to give me some more hard stares from time to time. And in between, a lone butterfly appeared. I think that this is a comma, a rare visitor for us. In the afternoon, we were visited by Mike with his daughter Liz and her husband and daughter. Liz is a professional gardener and had come to look at a sick shrub to suggest a course of action. Targeted pruning was suggested and Mrs Tootlepedal will put this into action. ….but I am sorry to say that they were bamboozled. I had to refill it. Mrs Tootlepedal reported that she had been watched by a robin while she worked which is good news because we haven’t seen one around for several weeks. When we needed a rest, we watched bits of another good stage of the Tour de Yorkshire bike race on the telly. I didn’t envy the riders at all as they ground up the 1 in 4 slope at Sutton Bank. Even these superb athletes had to go at a very sedate pace to get up such a hill. I would have needed a lift in a car! 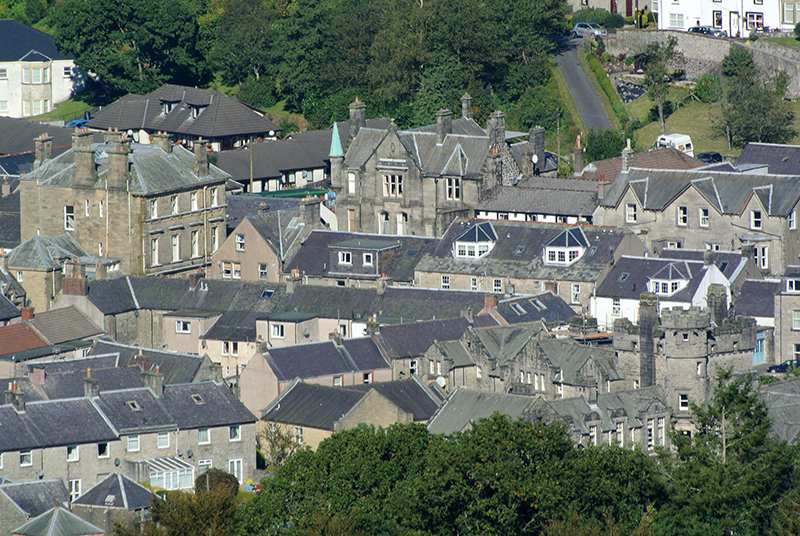 In the evening we went to the Buccleuch Centre to listen to a jazz trio led by a very good lady singer who has lived locally for the last few years and with the piano played by our Langholm Sings accompanist, Nick. He turned out to be a very accomplished jazz player with a great sense of rhythm and good invention and as the singer and bassist were very good too, it was just my cup of tea and I enjoyed it thoroughly. In all the gardening, I didn’t have time to get a solo flying bird of the day so once again it is a pair, this time seen from behind. The guest picture of day comes from my brother Andrew, who looked up when he was visiting York Minster. Once again, we woke to a gloomy, damp day but it had the goodness to stop raining while I visited the dentist for a check up. It was pleasantly warm as I walked home having been given the all clear but the garden was still looking fairly damp when I got there. …and if you look closely, you can see three beasties collecting pollen from the poppy above at the same time. I can’t make up my mind whether these rather fluffy yellow things are bumble bees or not. 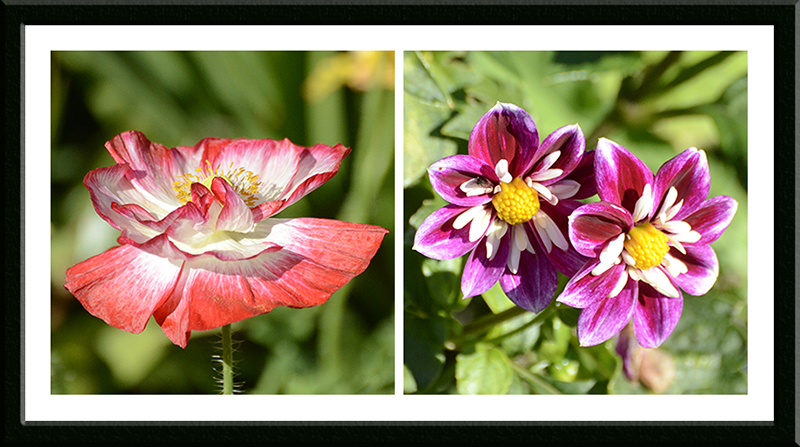 I don’t think that the ones on the poppy are but I am less sure about the one on the dahlia. Once again, I hoped to be helped out by knowledgeable readers. My daughter has been in Portugal for a short break and very kindly sent me a tin of genuine Portuguese sardines so we had some very tasty sardine pâté for our lunch. She knows that my brain needs all the help it can get from oily fish. After lunch, the weather brightened up a lot and we walked to our church in glorious sunshine to celebrate the life of Charlie Edgar, a member of Mrs Tootlepedal’s Church Choir who died recently. Mrs Tootlepedal has had a long association with Charlie, both through the choir and the local amateur operatic society of which he was a mainstay for many years. We sang two cheerful hymns and heard a very fine eulogy written and read by a friend so although memorial services are by their nature not something that you look forward to going to, this one was a very fitting tribute to a good man. In spite of the sunshine, it was still a bit too soggy to contemplate some mowing when we got home so after a pause to catch up on the highlights of yesterday’s stage of the Vuelta on the telly, I got the fairly speedy bike out and did a very modest vuelta of my own. It was perfect cycling weather – warm, sunny but not too hot and with a light wind to provide a little cooling when needed. 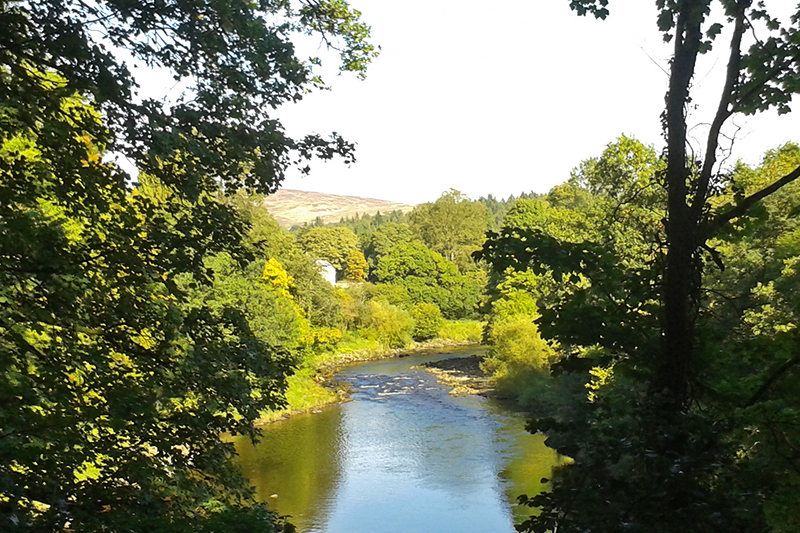 I went out of town up the Esk Valley and enjoyed the views as I went. As I pedalled up the road towards Bailliehill, I stopped to admire the heather..
…and looked back at the Esk in the valley below. Whereas farmers get very basic bridges, I got a fine stone bridge to cross a small tributary a bit further along. 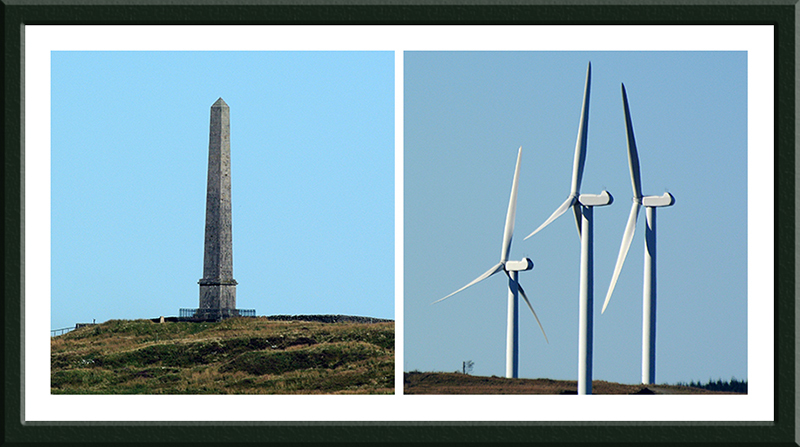 The road rose up from beside the stream and as I pedalled along, I could look across and see the tops of all six of the new windmills on Ewe Hill on the other side of the valley. I was very pleased to see that they were indicating that I would have what wind there was at my back for the last ten miles of my journey. As I rode up the hill at Callister, I passed some birds who are planning a trip of their own quite soon. While I pedalled along, I reflected that the bicycle really is a wonderful invention. A day or two ago, we watched the finest runners in the world run the Olympic marathon on flat roads. Today, I went about the same distance over much hillier terrain and under my own steam in a time some ten minutes quicker than they had managed. Running is a very pedestrian way of getting about, as they say. Those interested in the route can click on the map below. 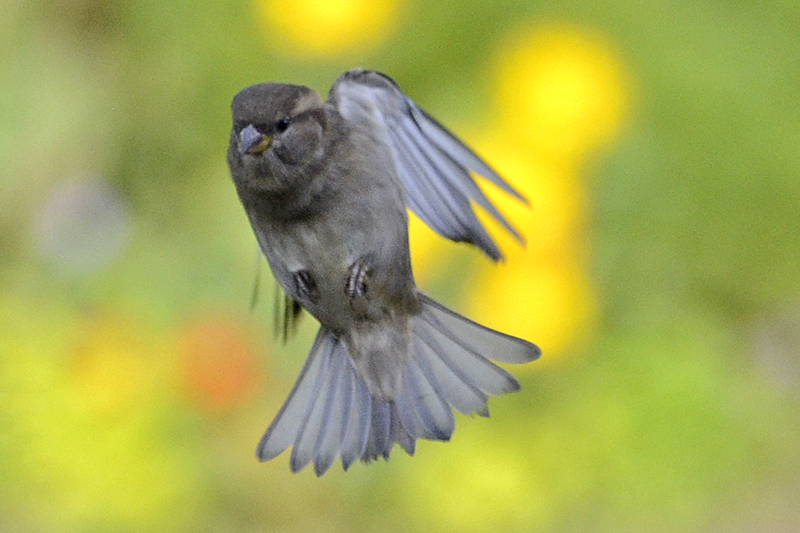 I was hoping to go for a little flying bird walk when I got back but the clouds had returned and the light was not promising enough to make it worthwhile so I wandered round the garden instead for a few minutes…. …and then went in to have a shower and make baked eggs in spinach with a cheese sauce for our tea. I had some very tasty cheese to hand so this rounded off the day very well. After tea, we watched the highlights of today’s stage of the Vuelta so we had a double helping of cycling to enjoy. It looks as though it will be an interesting race. We are promised a day of sunshine tomorrow. We are very much looking forward to that. The flower of the day is another in the long line of poppies. I find them very hard to resist. 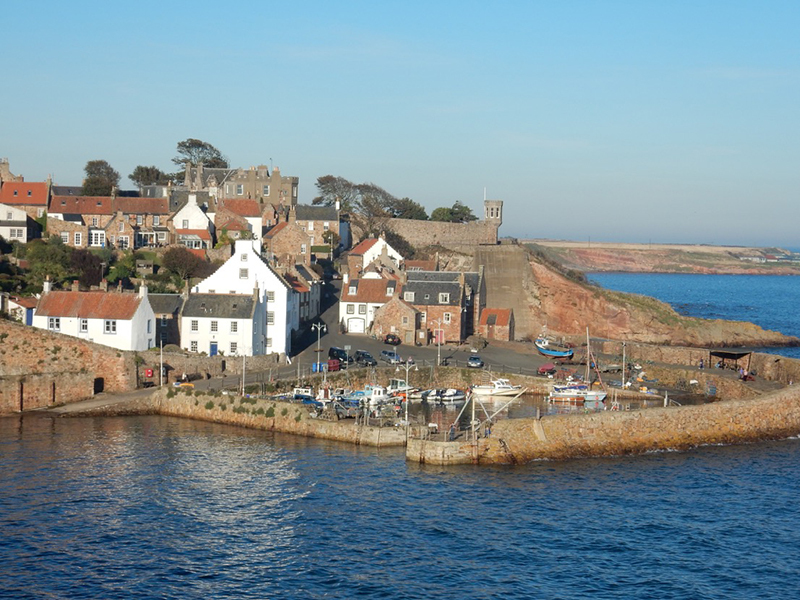 Today’s guest picture was sent to me by my neighbour Gavin and shows the harbour at Crail on the east coast where he is on holiday. We have booked a holiday cottage nearby for next April and I can guarantee that the weather won’t be this nice then. It was a day of perfect autumn weather, crisp in the morning, pleasantly warm in the afternoon and cooling down as the evening wore on. There was not a cloud in the sky all day and the conditions above the town were such that passing aircraft were not leaving vapour trails to spoil the blueness. After putting a week of the newspaper index into the Archive Group database, I spent the morning entertaining first Sandy to a cup of coffee when he had finished filling the Moorland bird feeders and then Dropscone, when he had finished a few holes of a golf with a friend. In between times, I walked round the garden enjoying the colour in the sunshine. The colour didn’t just come from the flowers. 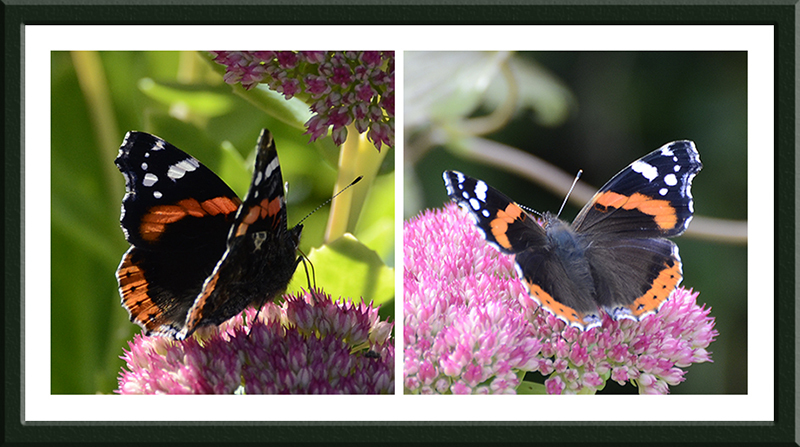 The were several peacocks and red admirals about, the first time that there have been a lot of butterflies in the garden this year. Sometimes they were side by side. 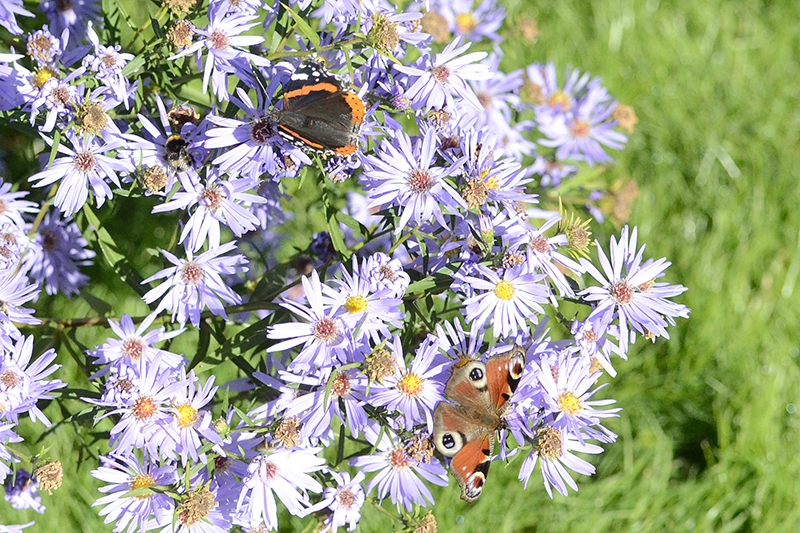 The Michaelmas daisies and the sedum were the two favourite attractions but almost anything that was out had a visitor or two. The bumble bees preferred the sedum and in the afternoon I counted over 150 bees on the plants beside our bird feeder. It was quite an amazing sight. 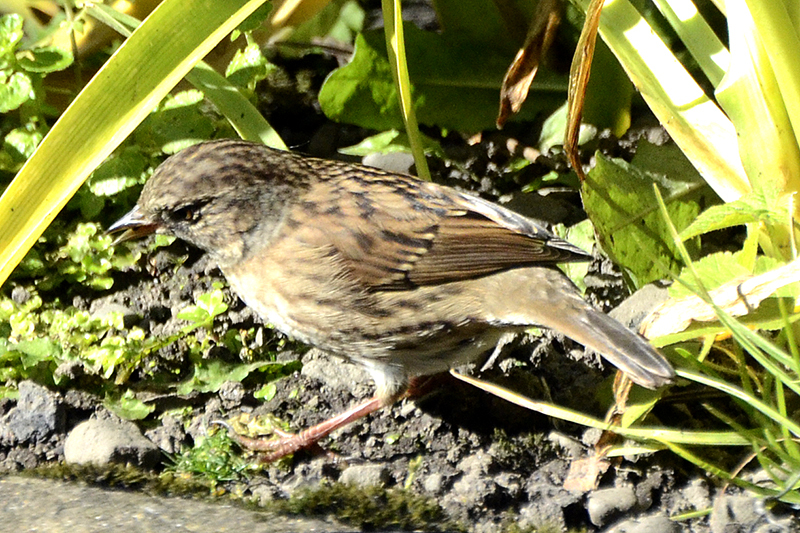 After lunch, Mrs Tootlepedal went off to help with the driving for the disabled and I watched the birds for a while. 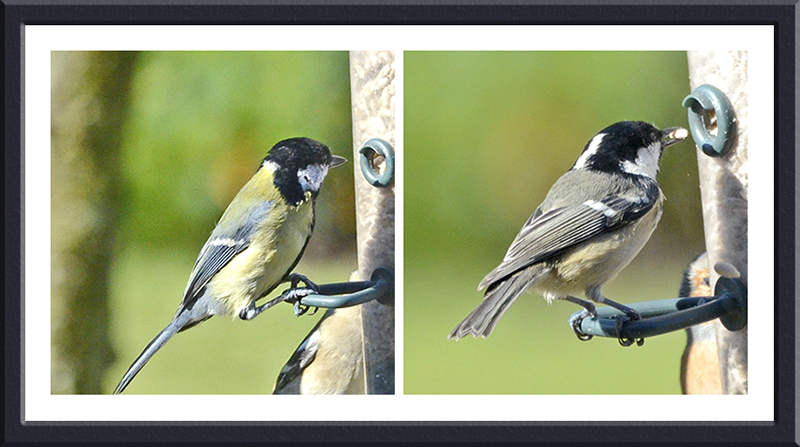 I have put some tasty morsels into the new covered feeder and they are being eaten but never when I am watching so I was pleased to see these two at the other feeder. 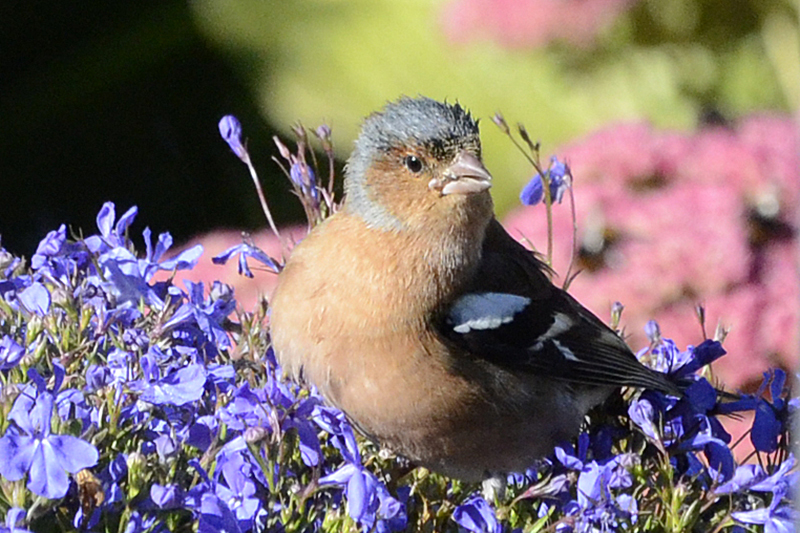 …and a chaffinch pretended to be a flower. Then I took a walk up Warbla to enjoy the day. 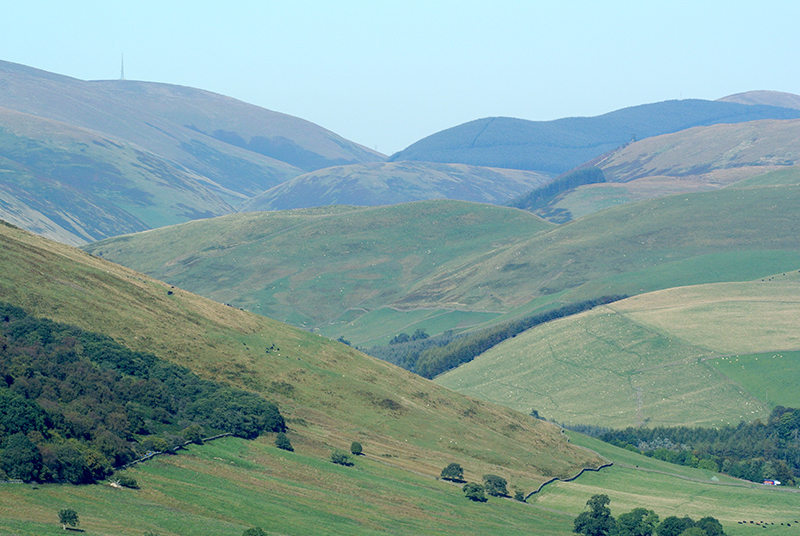 …but the views remained very satisfying. 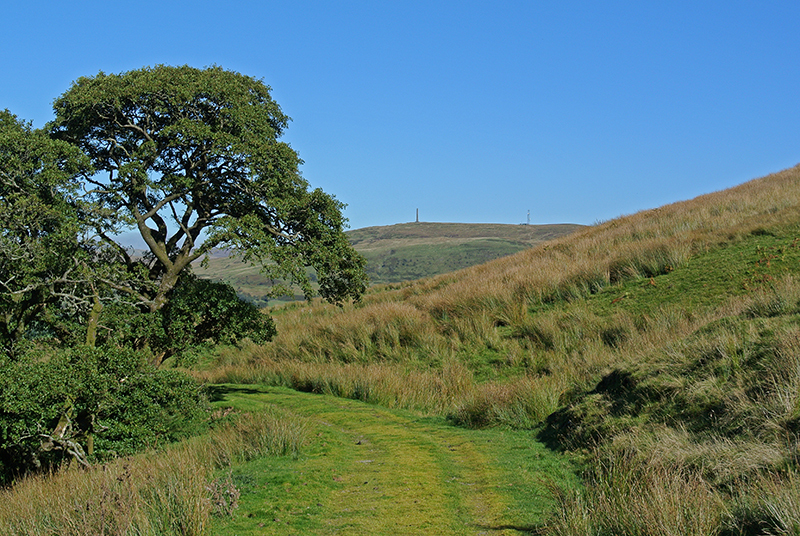 I looked across to Meikleholm hill where I had seen the scabious plants. I walked up the track to the top of the hill and looked around. The phone panorama function looked around too. I had Pocketcam (Nikon J1) with me and it has an ingenious mount so that I can attach my DSLR lenses to it and get a vastly increased zoom. The fine weather gave me a chance to try this out. 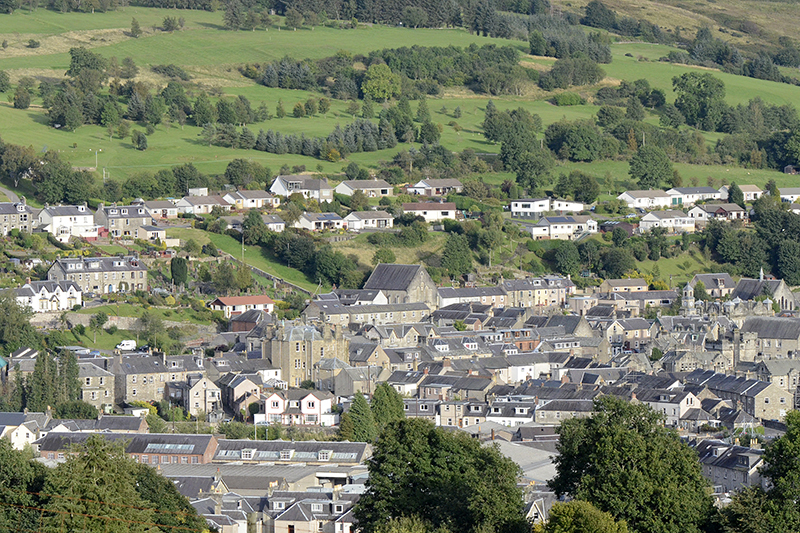 I put my 70-300mm lens on the mount and looked down towards the town…. 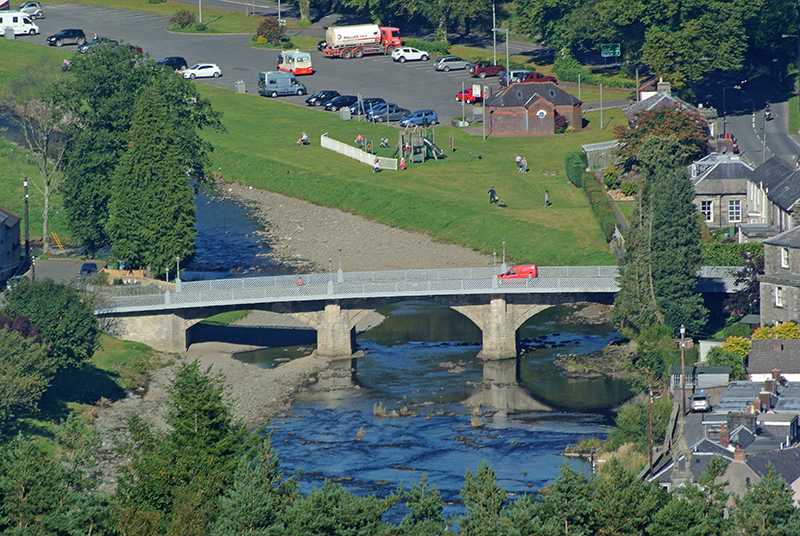 The bridge is a mile (1.6km) away from where I was standing. I was quite impressed. 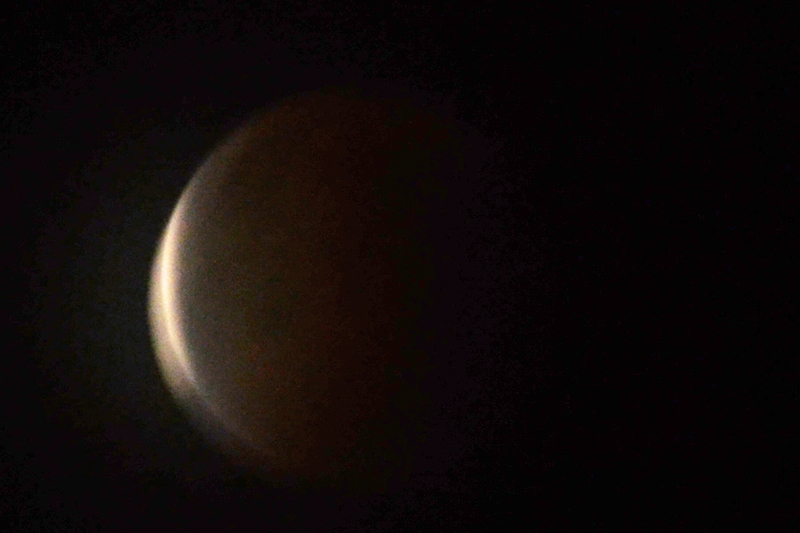 I would need a tripod and delayed shutter release to get the best out of it but it obviously has great possibilities. I looked east and west. …and my phone again for a wider picture…. 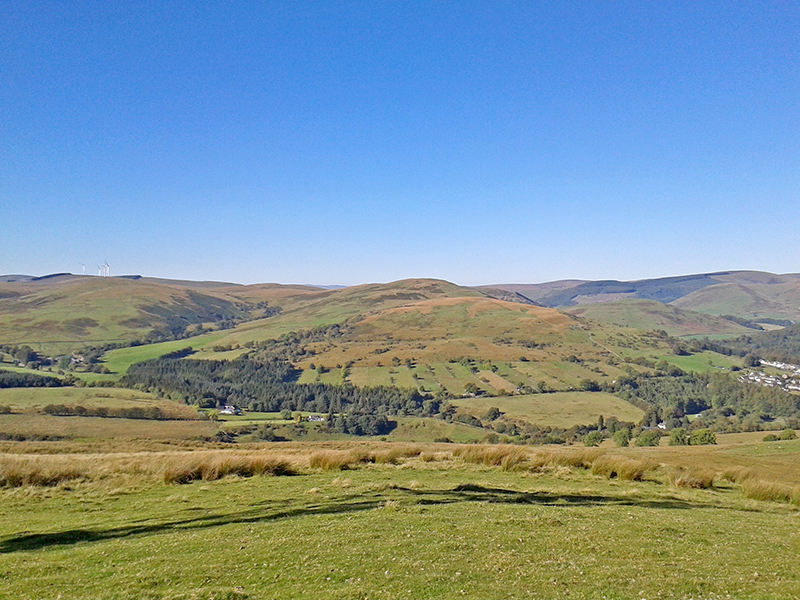 It was good to be alive on a day like this, with a gentle breeze keeping me cool on the top of the hill. I walked back down and took a shot on my way with Pocketcam with its own 10-30 lens on. 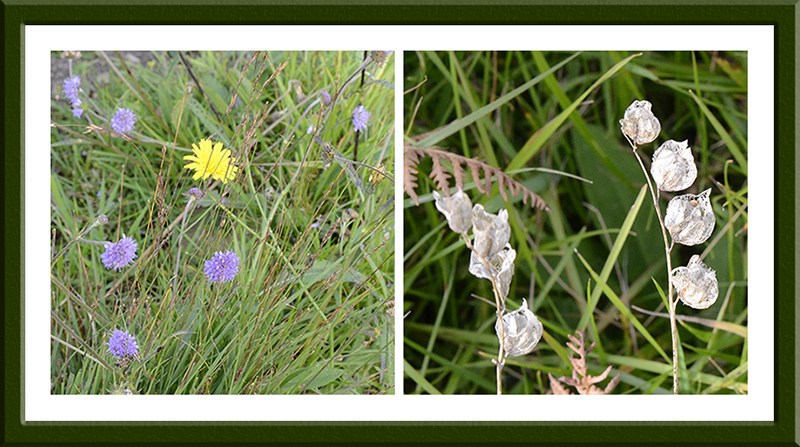 I was just thinking that whatever the charms of the walk were, a lot of wild flowers were not among them when a splash of colour caught my eye. It turned out not to be a wild flower though but my friend Tom, taking a little fresh air after a morning conducting mock interviews with fourth year school pupils. I exchanged greetings with him and made my way home via Gaskell’s Walk. Tucked away in a little valley with no cooling breeze, the heat was considerable and I was glad to get back into the cool of the house. I went up to the town to do a little business and when I got back Tom appeared with some coffee beans. He had inadvertently picked them up while shopping, not realising that they were beans so I ground them up for him and recommended buying a grinder of his own so that he could always have freshly ground coffee at home. 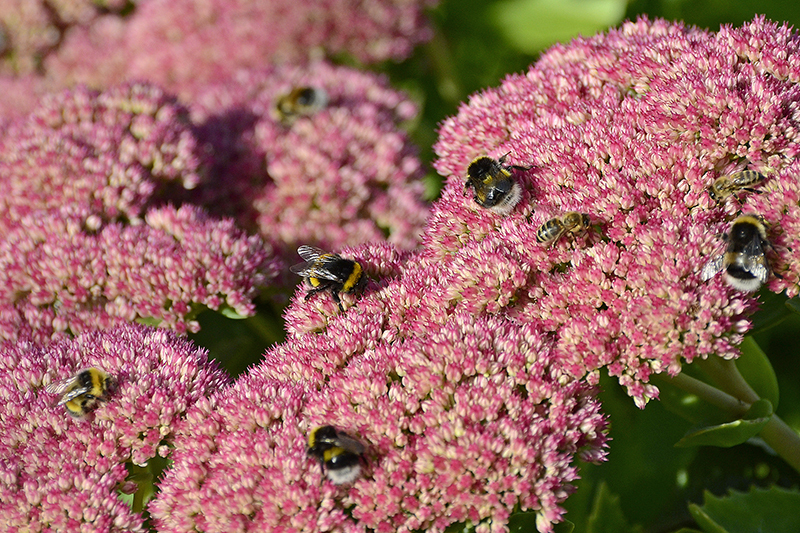 Mike Tinker dropped in and was impressed by the great bumble bee collection on the sedum. 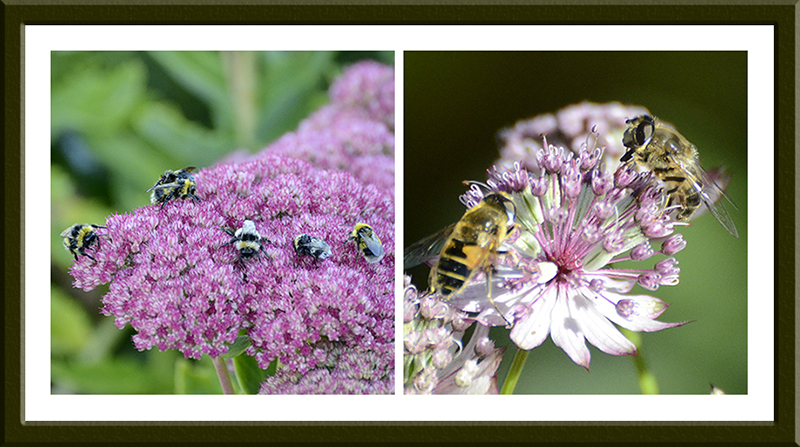 We keep on being told that our bees are declining in numbers so perhaps they have all come to our garden this week. Mrs Tootlepedal returned from her pony driving and claimed to have seen a cloud in the south as she drove home. We didn’t believe her. In the evening, I went off with Sandy to do some work at the Archive Centre and with the internet connection working well, we got quite a lot done. The forecast says that our spell of good weather may be coming to an end in a day or two but it has been great while it has lasted and I apologise for the flood of pictures it has unleashed on you long suffering blog readers. Things should calm down soon. 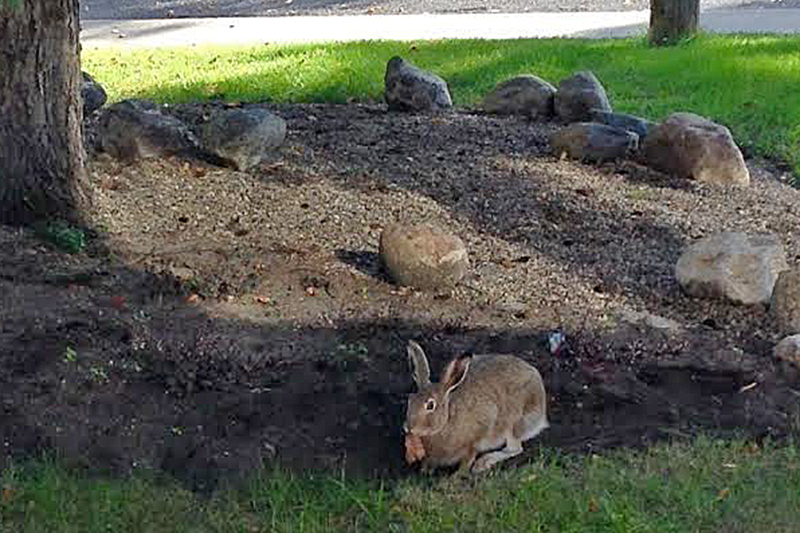 Today’s guest picture comes from Mary Jo in Manitoba and shows a rather strange extra rock under the tree in her garden. Our run of really good weather continued today, although the temperatures are definitely getting chilly in the morning. 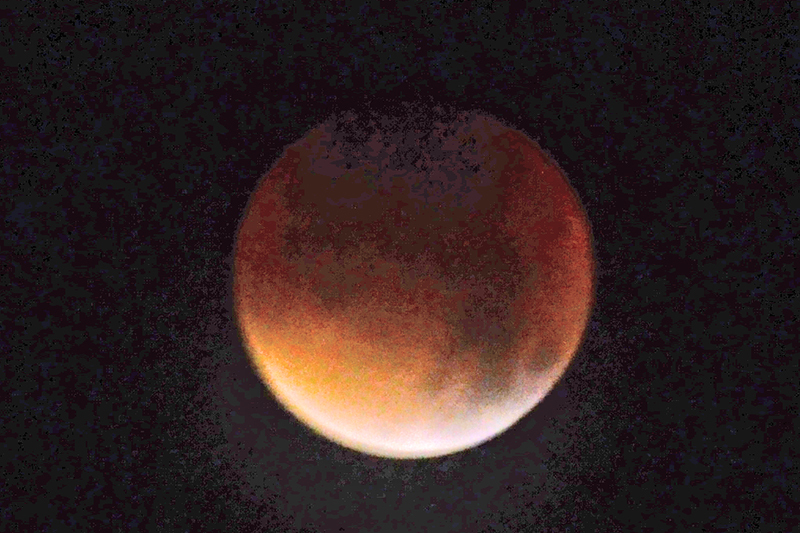 I was pleased to wake up at a reasonable time as I had set my alarm for first, three o’clock and then, half past four during the night in the hope of seeing the lunar eclipse. Mrs Tootlepedal and I did wake up and see the eclipse but it didn’t seem to be quite as exciting as we had been promised. 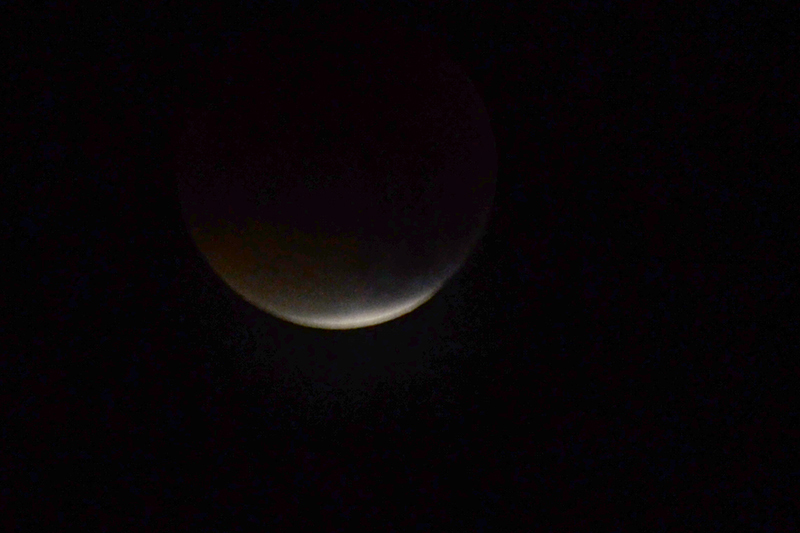 This is what we saw around 3am. The camera saw more than we did. My second view at 4.30am was not much more exciting. Mrs Tootlepedal saw some much better shots on the TV news. The cold morning kept me hanging about for an hour after breakfast before I set off on the fairly speedy bike to make the best of the sunshine. The temperature was still in single figures C but the sunny weather kept me warm. I was a bit pressed for time so I stuck to an easy route and a modest distance of thirty miles. 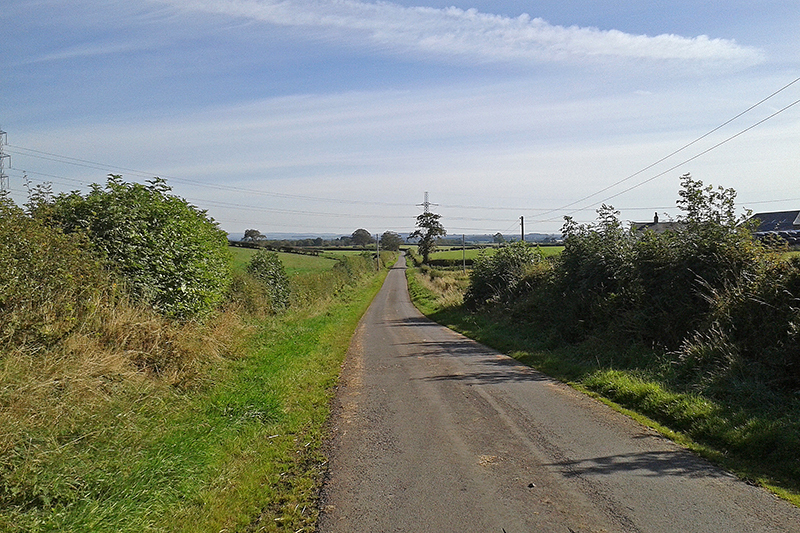 I took a couple of pictures of the quiet roads that I followed. One in Scotland…. 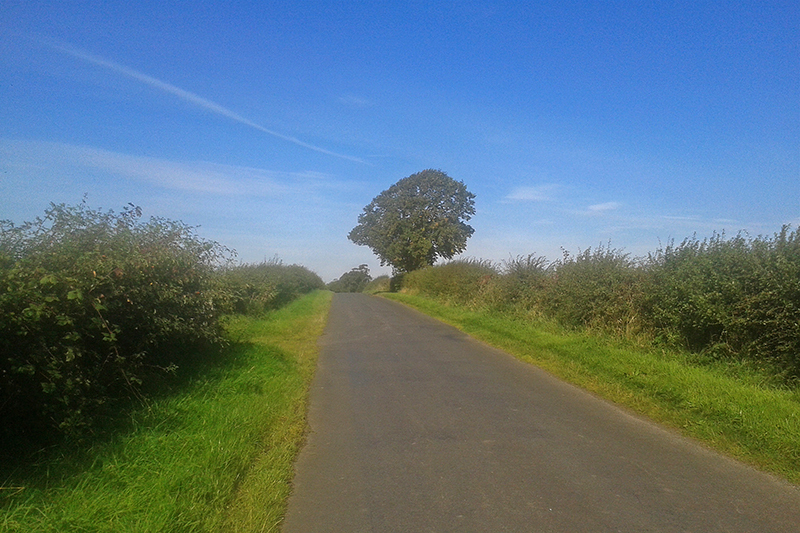 I hardly saw any traffic, either motorised or on four legs, so I had a very tranquil spin round the low country. I had time for a shower, lunch and a quick look at the sedum before going off to do my stint in the Information Hub on the High Street. The sedum was busier than ever. I counted over a hundred insects on it today. 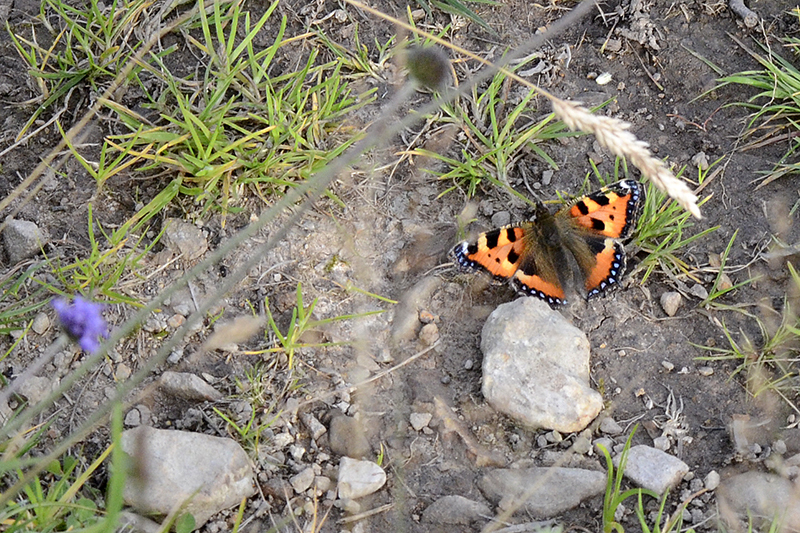 Among the bees and hoverflies, a lone butterfly appeared again. My two hours at the IH were far from boring today as I had several customers visiting the art exhibition there. I even sold one of them a painting. 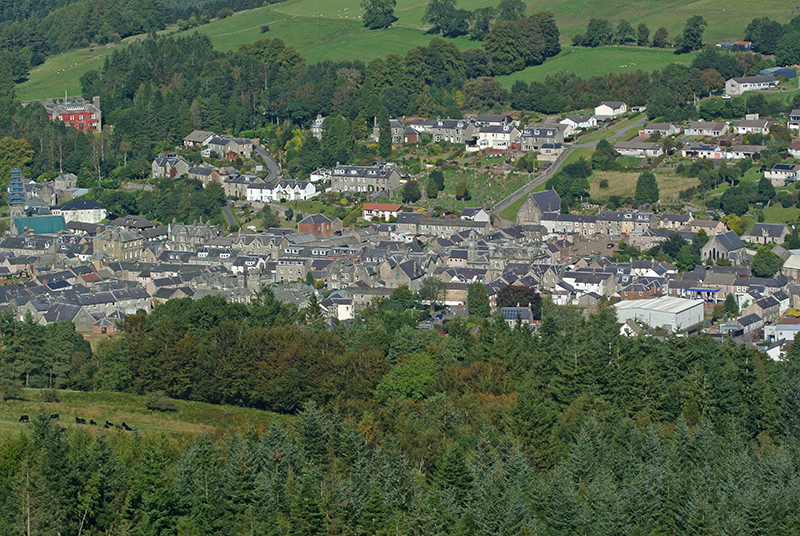 I also sold a copy of the Langholm Walks to a local resident who told us that he had had an excellent view of the eclipse last nigh from his house which is up on the hill above the town. I was also entertained by a visit from Dropscone who had returned from golf lesson in Carlisle so the time passed very pleasantly. 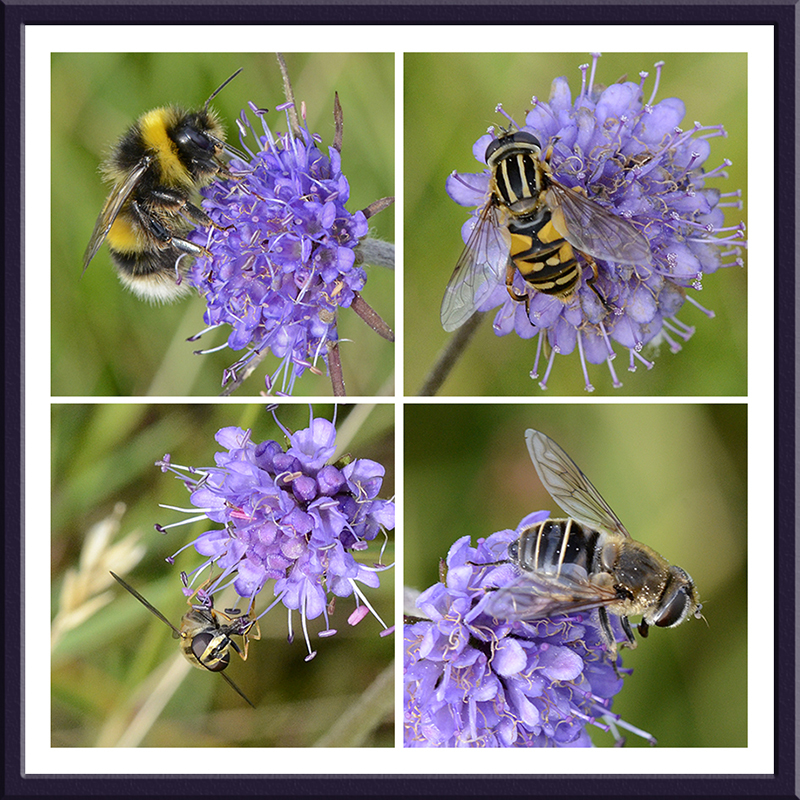 When I got home, I turned down an offer of a cup of tea with Mike Tinker and whisked Mrs Tootlepedal off to visit the scabious on the hill which I had seen a few days ago. 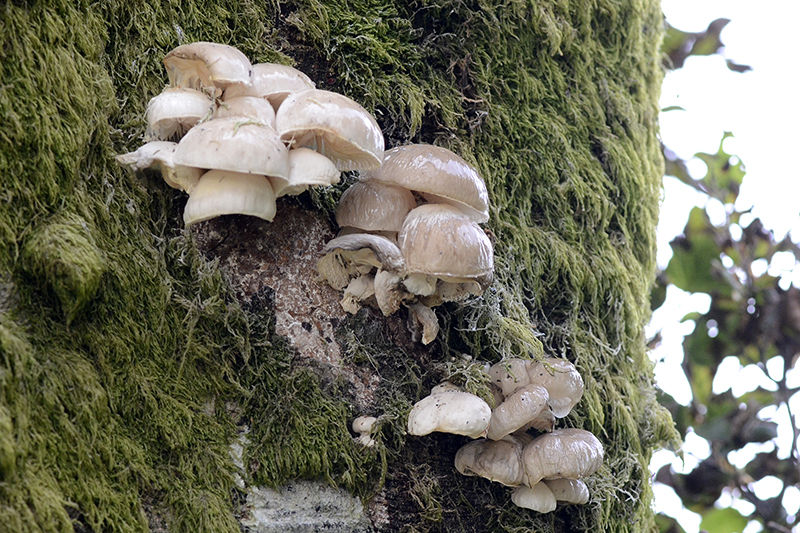 The fungus on the tree stump on the track up to the open hill had lasted very well…. 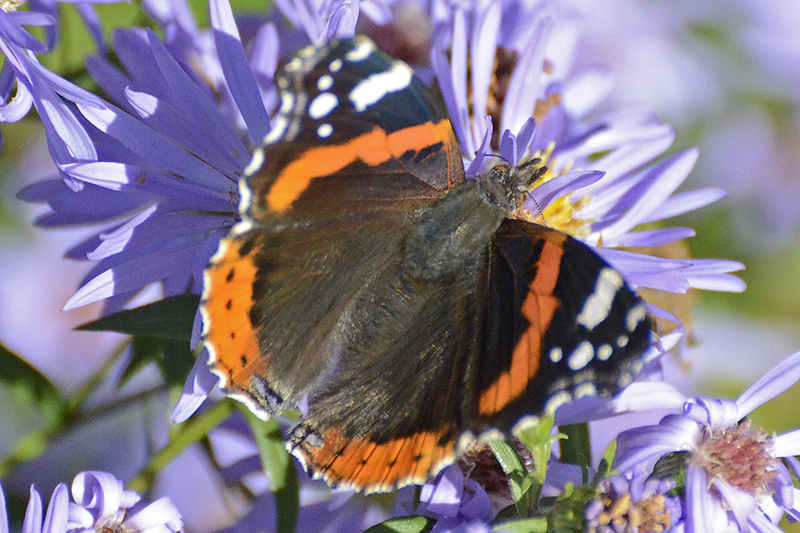 …but sadly most of the scabious had gone over and I wasn’t able to show Mrs Tootlepedal the full display. 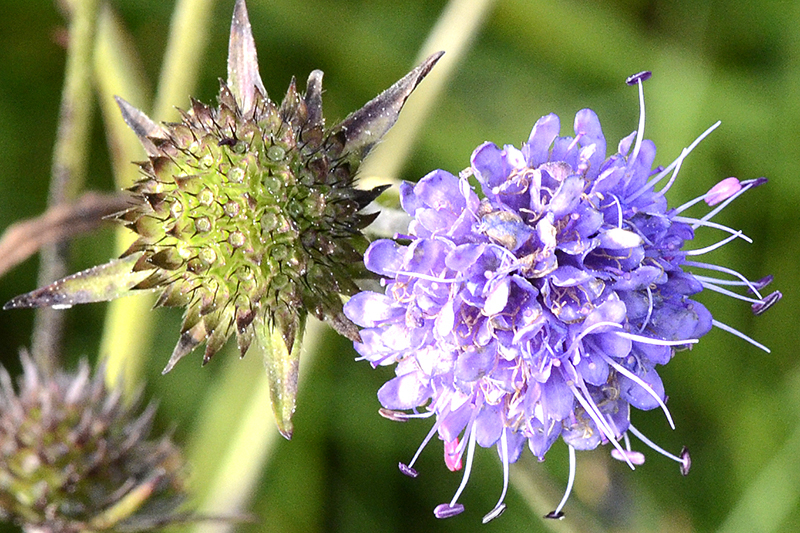 What scabious there was still in flower was very attractive to insects and almost every flower had a friend. 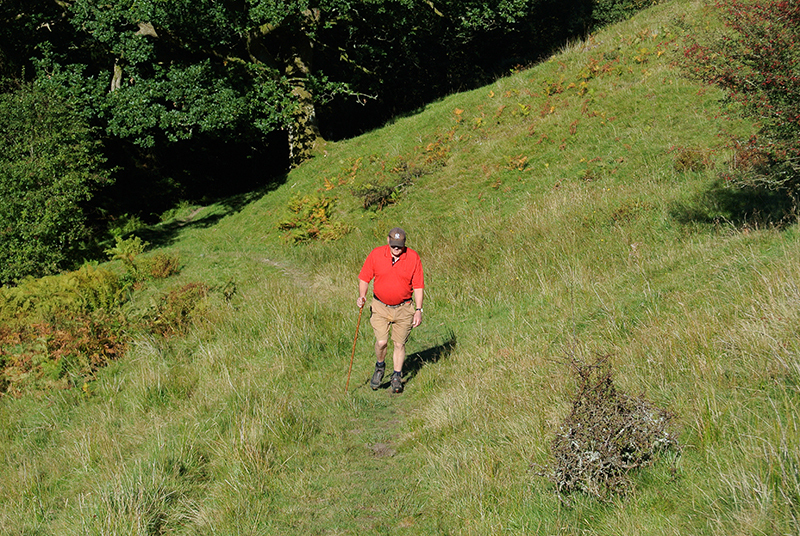 I was a bit disappointed but Mrs Tootlepedal was very amiable and the walk was a delight in itself. There was plenty to see. 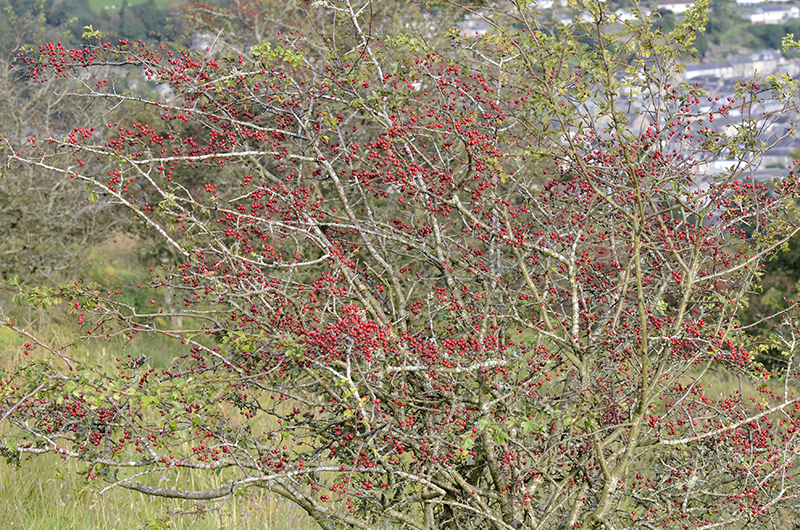 The hawthorns seem either to have hardly any berries or a great profusion. 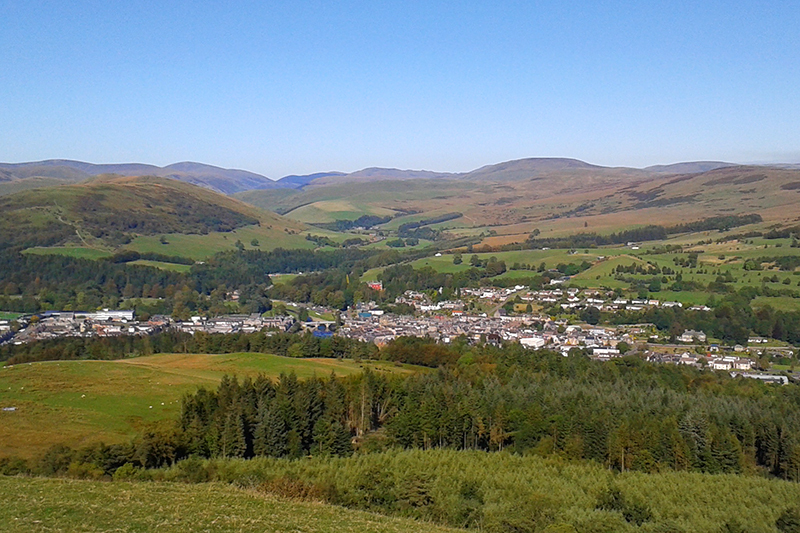 It is always a pleasure to look down at the town tucked neatly among the hills. 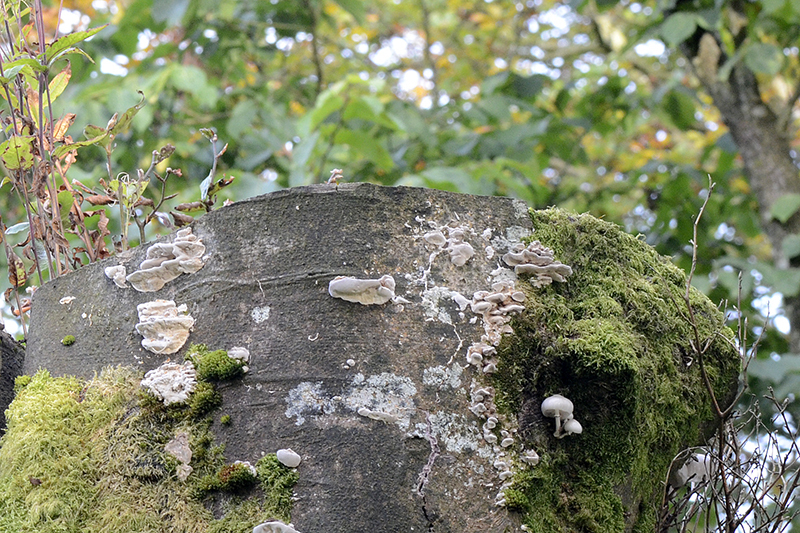 I had another look at the tree stump with fungus as we passed it on the way back and saw that it had a different crop at the very top. We got back in time for me to have a cup of tea before my flute pupil Luke came for his regular practice. He is playing in a school concert this week so we ran through his piece for that and then we played some duets. Once again, time was a bit short but I had time for my tea before going out to play trios with Isabel and Mike. They had both got up to see the eclipse but had not been very impressed. We had a good play though, in spite of the lack of sleep and there is a fair chance that several of the composers might even have recognised the pieces that we were playing. 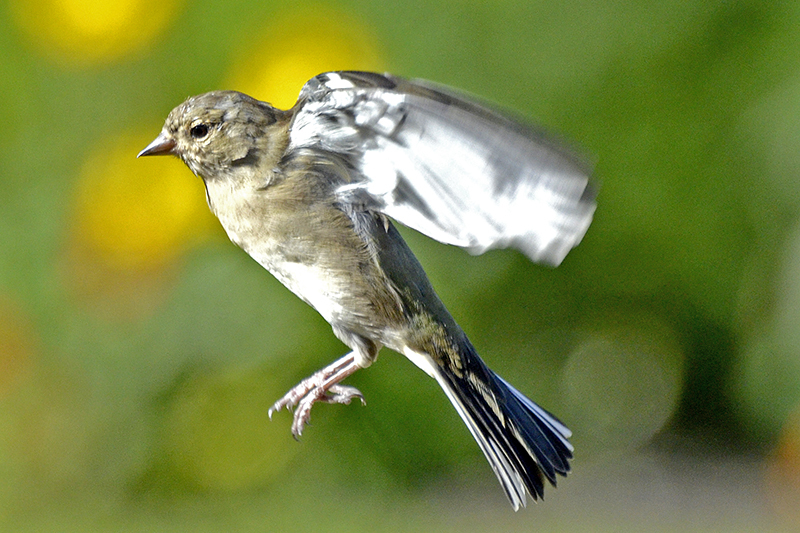 In all the rushing about, I didn’t have time to get a good flying bird shot and this was my best effort.